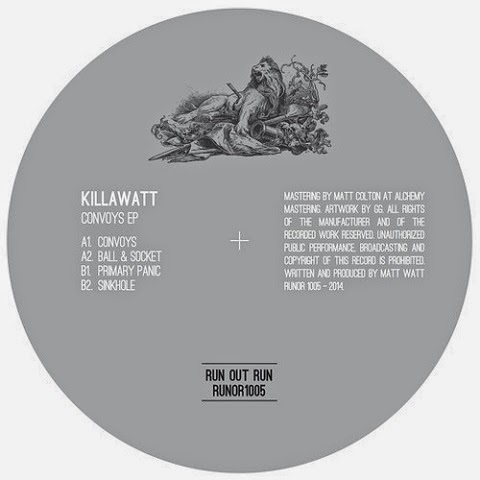 Killawatt, a young UK artist initially trying out the dubstep side and hanging around mostly with Osiris Music, quickly adapted a wider view on the club music and “Convoys EP” on Tom Dicicco’s Run Out Run imprint pledges for shout-outs of the techno faction. The title cut “Convoys” sets off to thunderball mission with stealth snares and swirling synth lines, while “Ball & Socket” comes with obvious UK bass influences, resting on an elastic vocal sample and a distant terrace chant at the matches. On the flip, nasty drum kick, toxic bass line and crumbled vocal loop push “Primary Panic” to the peak-hour zone. After the EP’s highlight, the thrill is not yet over because we are drawn all the way down to “Sink Hole” with the power of alarming stabs and stepping drums. An all-around strong release that could be described with an often abused reference: funky techno.